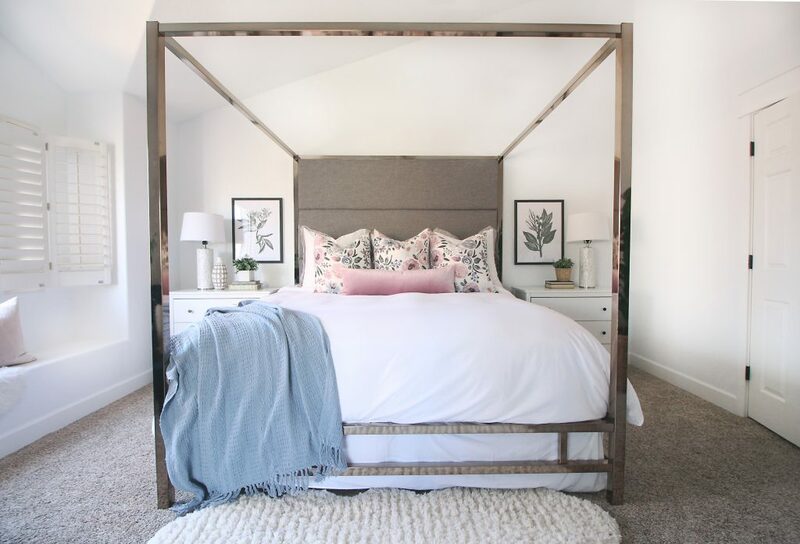 I’m so excited to share my master bedroom decor refresh! 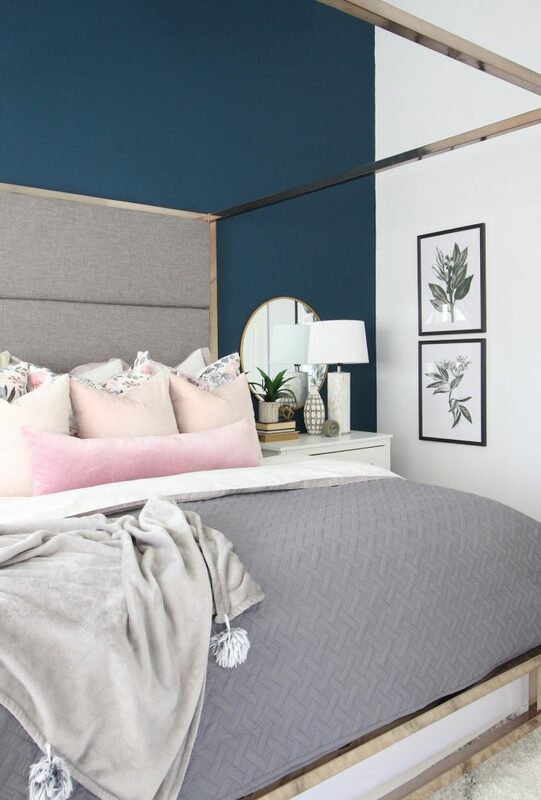 I added a touch of drama to my master bedroom decor with a moody accent wall in my own custom color that I mixed MYSELF to help kick off Ace Hardware’s Neighborhood Paint Party this Saturday! This post is sponsored by Ace Hardware. All thoughts and opinions are my own. A few months ago, I chose our master bedroom decor for our new house and started decorating! 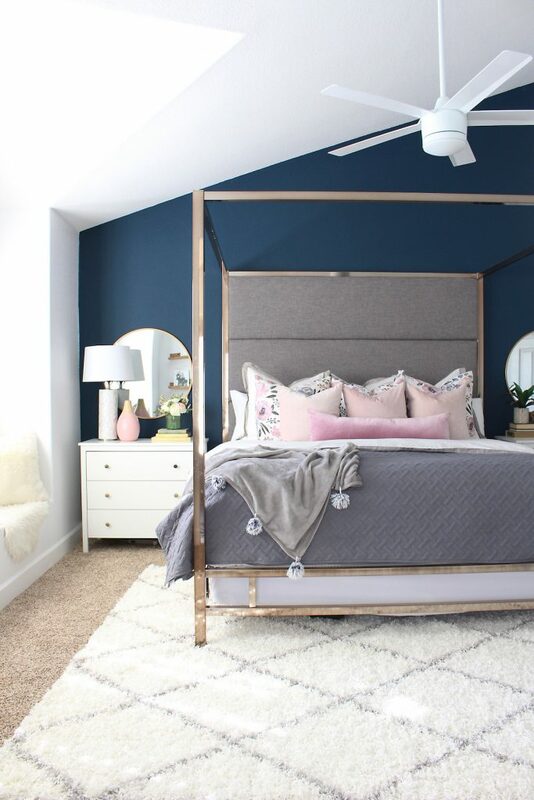 I shared that makeover with you back in November on our Master Bedroom Reveal. I wanted to keep my same bedding, nightstands and dresser but wanted to refresh our master bedroom decor from our master bedroom at our old house. Our old house had a dusty blue shiplap wall and I absolutely loved it but I wanted something different in our new house. I really love this space but I went back and forth about a million times deciding if I should do an accent wall or not. I brainstormed accent wall ideas for weeks. 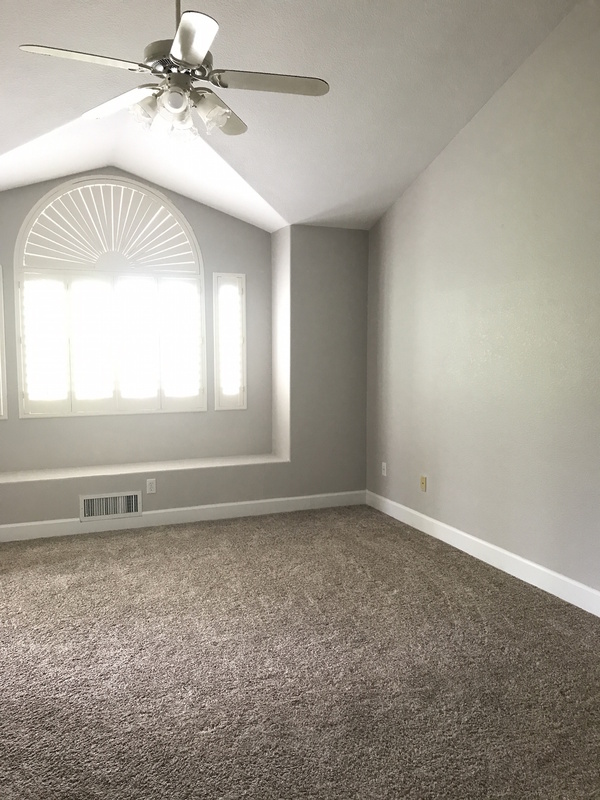 Do I paint one focal wall? All of the walls? Wallpaper? Wainscoting? I couldn’t decide. I painted it white and let the bed and master bedroom decor be the stars. Fast forward to Ace Hardware inviting me to create my own custom paint color as a preview of their Color of the Year contest and biggest paint sale of the year! I got so excited and knew exactly what I wanted to create! Time to give this accent wall a bold punch of color! 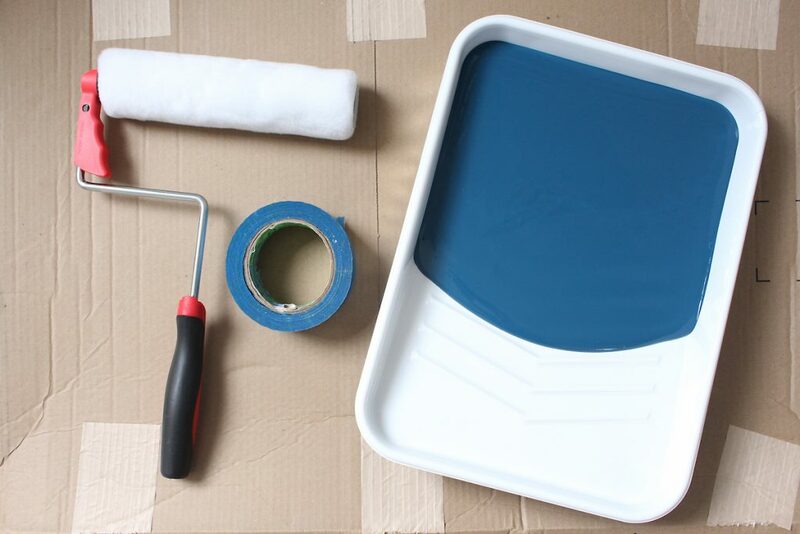 This weekend, I visited my local Ace Hardware and picked up some paint samples to create my own custom color, mixing until I found the perfect shade of blue! It was really fun- I felt like a little kid in art class! I decided I either wanted a deep navy with a hint of teal or I wanted a deep emerald green. This is also a sneak peek of what you’ll get to experience in store at participating Ace’s Neighborhood Paint Party on the 24th – you have to try it! I mixed a few samples and fell in love with the dark navy + teal combination. I named my color “Playful Peacock”. I totally think it fits the color perfectly. 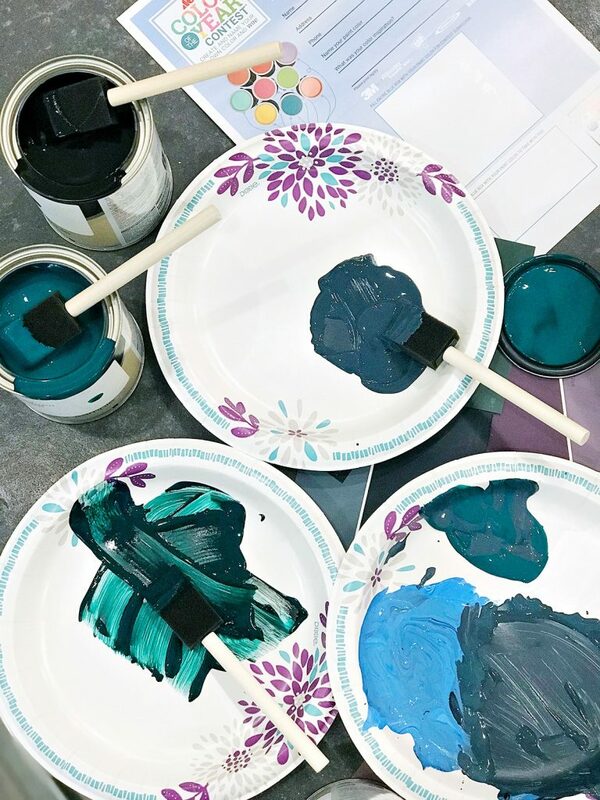 I filled out the Color of the Year form my local Ace provided to me and took my color sample back to Ace Hardware, The helpful Ace associates mixed up a couple gallons of my custom paint color in their Clark+Kensington Paint right on-site. They were super helpful throughout the whole process! I chose a flat finish so that my wall had a matte (not shiny) sheen. I painted two coats of my new custom color “Playful Peacock” and I sat on the bed watching the paint dry in awe. I was seriously thinking, “how on Earth did I mix this color myself? It’s so cool!” It is honestly such a beautiful color! 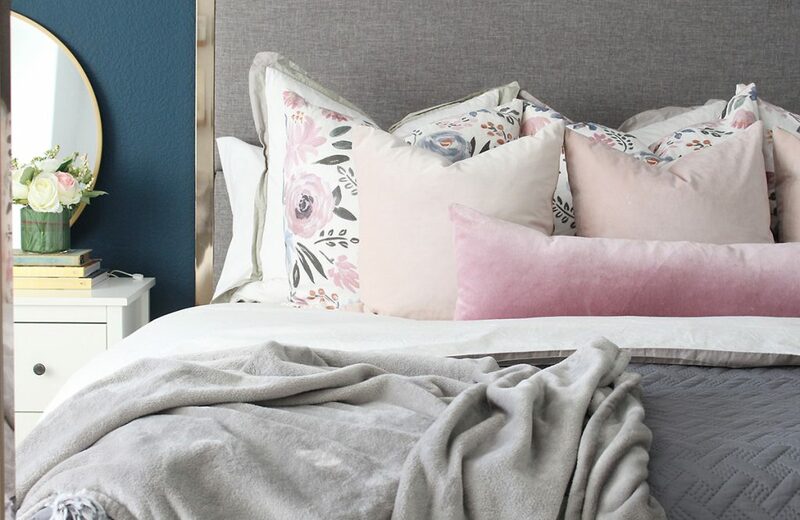 I think it pairs perfectly with my floral pillows and I love this color paired with my pink velvet pillows too. 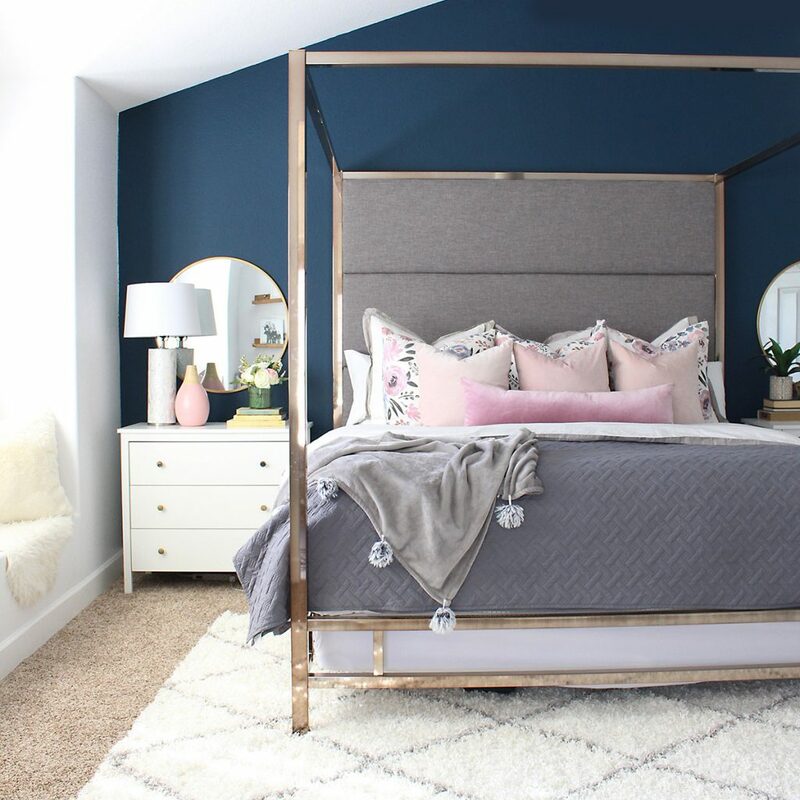 Navy/Teal + Blush pink is always a good choice! I love that it adds some depth to the space and actually accentuates the vaulted ceiling that wasn’t as obvious when the wall was white. 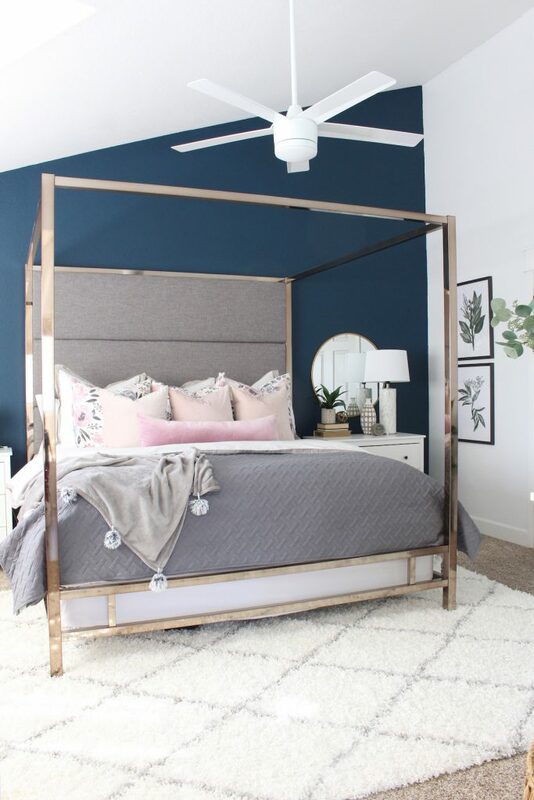 I love that my rose gold canopy bed and white nightstands just pop off the newly painted accent wall. Now it’s YOUR turn to create and name your custom paint color! Participating Ace Hardware stores are celebrating their biggest paint sale of the year with the Neighborhood Paint Party this Saturday, March 24th from 11am to 2pm. You will have the chance to enter Ace’s first ever Color of the Year contest and enter to have YOUR custom-mixed color featured as Ace’s official 2019 Color of the Year and win a $1000 Ace Gift Card! Don’t miss Ace’s Biggest Paint Sale of the year! Now through March 26th, Ace is offering Buy One Get One Free on paint gallons of Valspar® Optimus, Valspar® Aspire, Clark+Kensington® and Royal® interior and exterior paint. Limit two free gallons total. You can even mix and match brands. Offer valid at participating stores from March 21st through March 26th. Discounted item must be of equal or lesser value. While supplies last. See store for details. You guys, did you know with Ace’s Extra Mile Promise, the store will help you get everything you need for your paint project the first time, or delivery is free! Isn’t that amazing!? 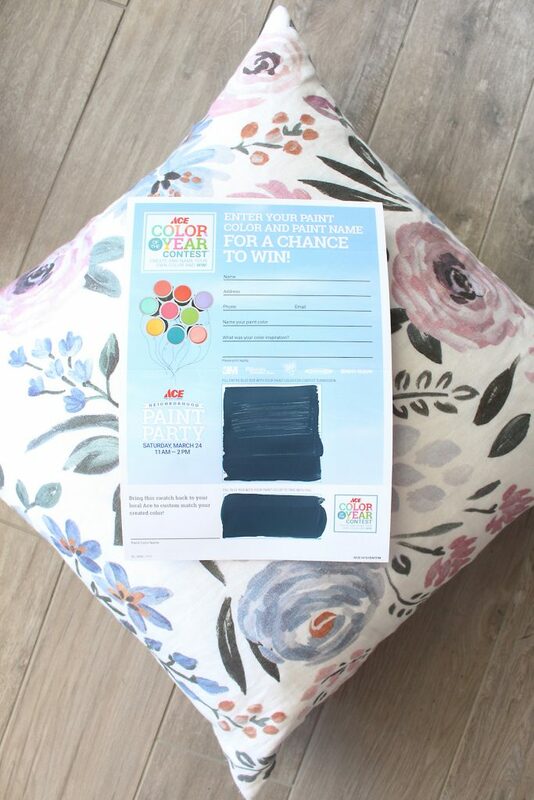 I really hope you’ll join me for this year’s Color of the Year contest and enter your custom-mixed color to win! Good luck, friends! Where are your lamps from? Sorry, never mind, I found the link. Thanks! Is this color available or do you have the color specs you could share? Sorry if I missed them! Is your custom color available to purchase at Ace stores? I need this accent wall in my life. Love the color!! Where did you get your floral throw pillows?? It all looks amazing! hi! where is this rug from? Thanks. Hey! It’s from Rugs USA! Amazon has it too! I LOVE that color and the name, it’s amazing! Where did you get your bedding? Specifically the gray quilt? I’ve been searching for one. Hi, sorry if I missed it where’s the bed from?